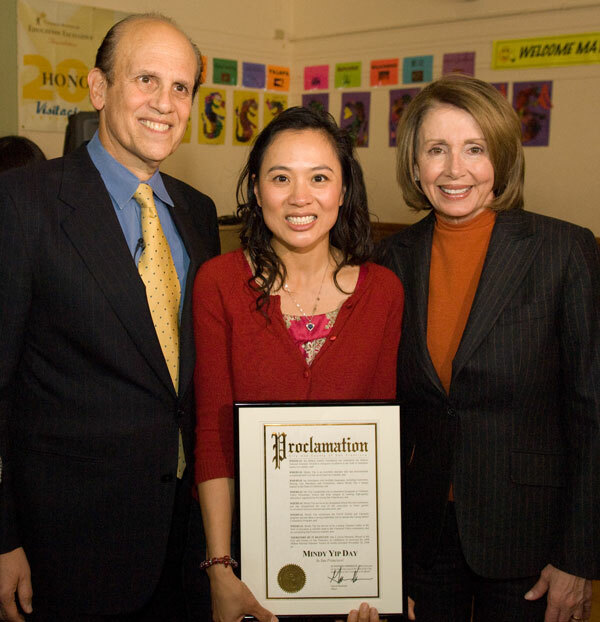 U.S. Speaker of the House Nancy Pelosi joined Mike at Visitacion Valley Elementary School in San Francisco to present a Milken Educator Award to first-grade teacher Mindy Yip. Yip, who is the school's Gifted and Talented Education (GATE) coordinator and lead teacher of the Expanded Collaboratives for Excellence in Learning (ExCEL) After School Programs, teaches at a school where two-thirds of the youngsters are English Language Learners (ELL) and where seven languages are spoken in students' homes. The Milken Family Foundation has honored more than 2,500 outstanding kindergarten-through-12th-grade educators with unrestricted, individual Milken Educator Awards of $25,000 since 1987.